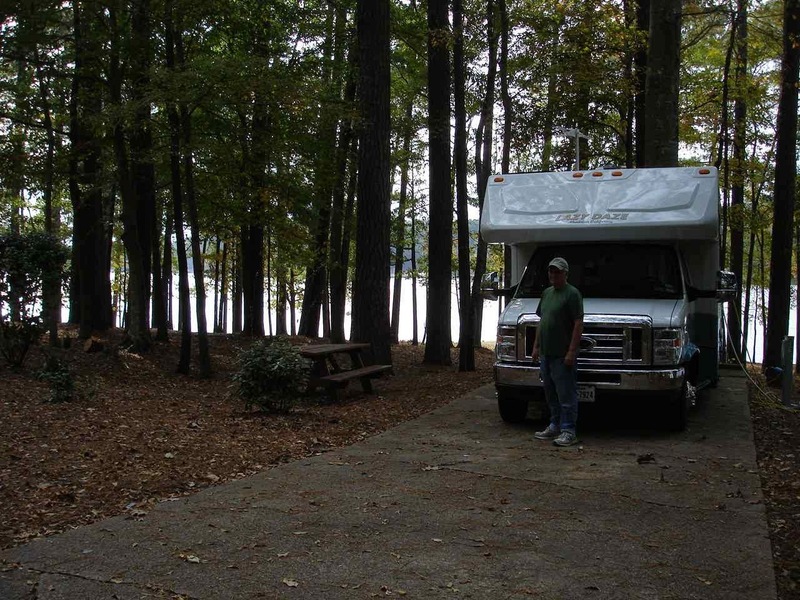 It was a different ride from Wind Creek State Park in eastern Alabama to Prairie Creek Campground COE between Montgomery and Selma, Alabama. Very rural, small towns, but great roads for travel. 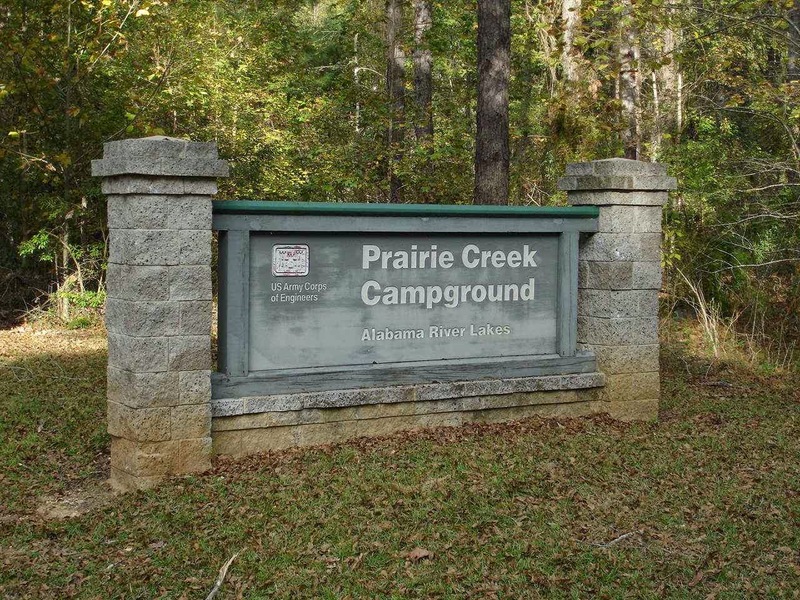 What seems to be in the middle of nowhere is actually a very nice Corps of Engineer campground on Prairie Creek which ties here directly into the Alabama River. Another beautiful view. Fish were jumpin'. One fisherman in front of our site was excited to show us the large fish he had just caught. Even the spiders liked our site. 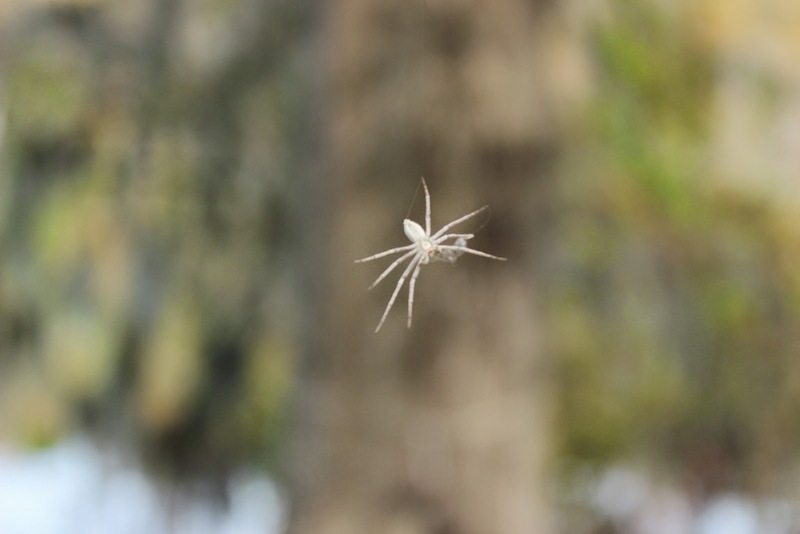 Hanging from the Spanish moss. 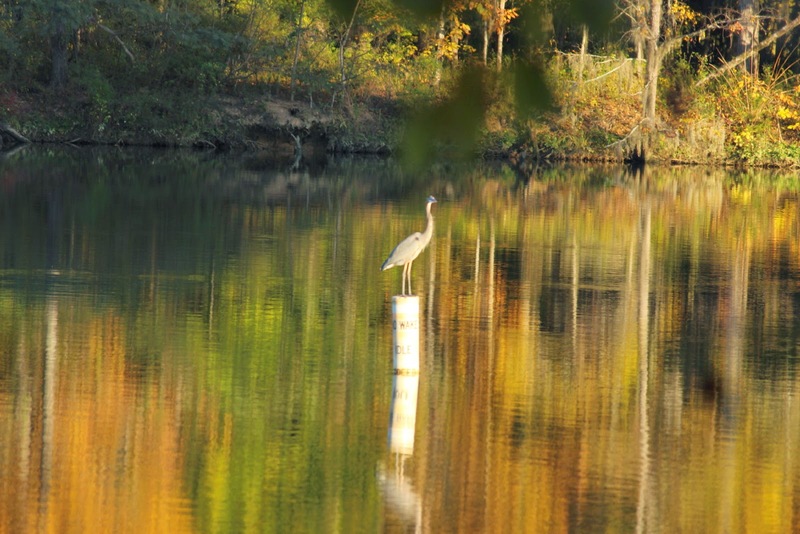 This heron used the river markers as perches and flew from one to the other looking for food. This section by our site was also a favorite for a kingfisher who loudly skimmed the surface and did quite well with fishing. 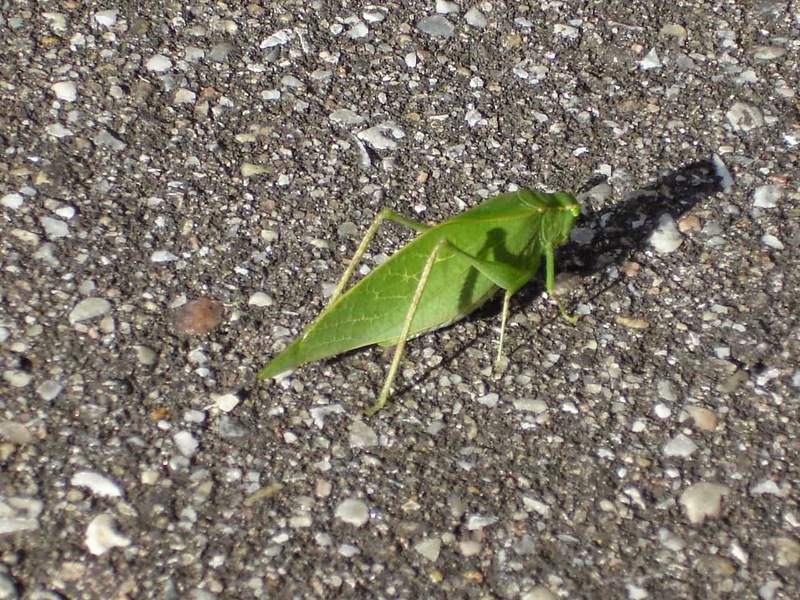 Saw this strange grasshopper at Prairie. Kind of looked like a grasshopper designed in the 1930's------like the Chrysler Building style. But really, looks like a leaf. I never get tired of what the southerners and westerners see as important parts of a COE campground. This little building is well built with good sized windows and screens for the bugs. Close to the boat launch. Yes!! You have it. 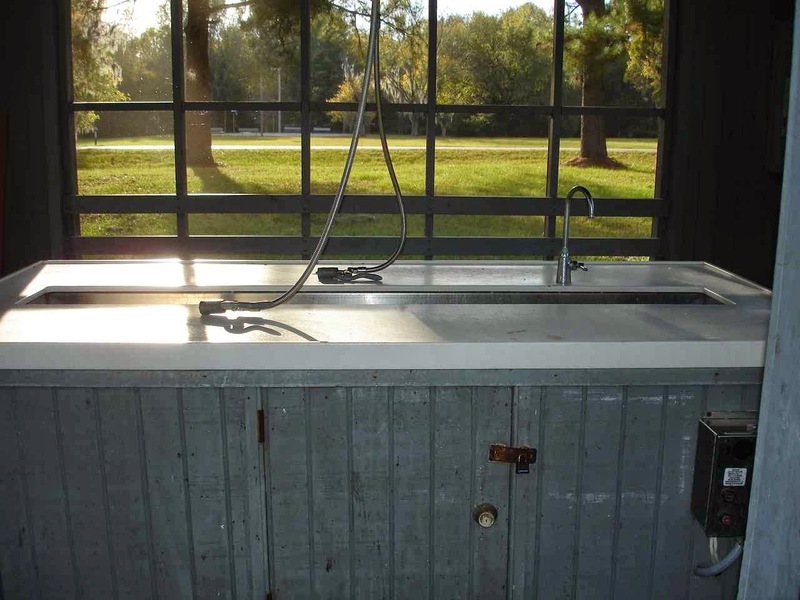 A very neat and well cared for fish cleaning station. 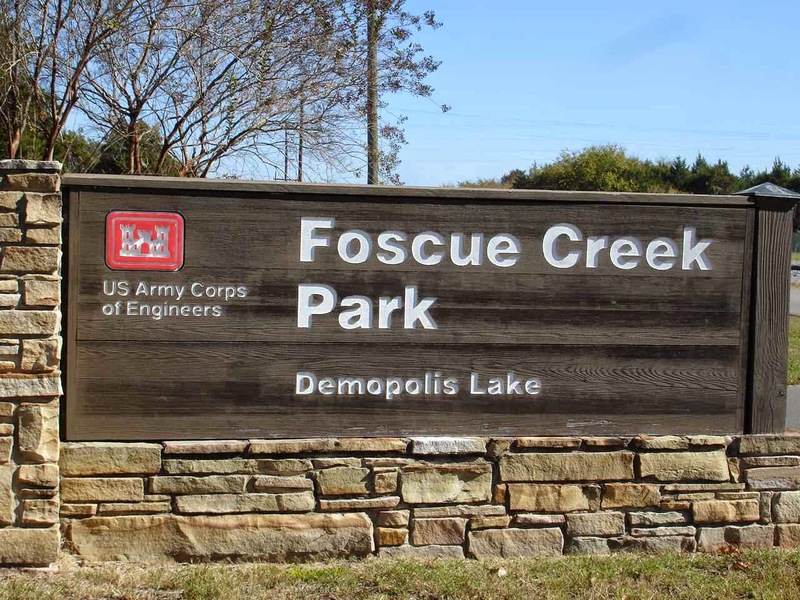 Heading west towards the Mississippi border, the next stop is Foscue Creek Park at Demopolis Lake. 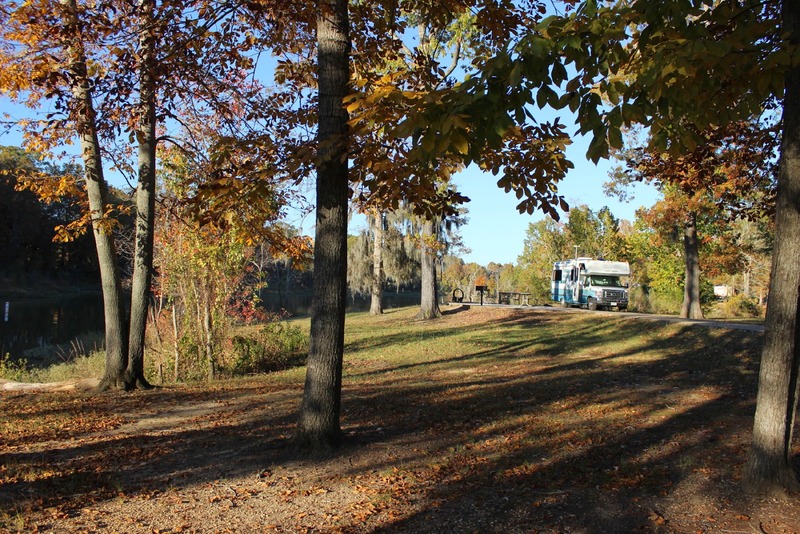 This is a very nice site on Foscue Creek which connects to the Tombigbee River. The Tombigbee connects with the Alabama River--south of Prairie Creek--and eventually empties out into Mobile Bay and the Gulf of Mexico. We met some very nice volunteers at Foscue, including Glenn and Caite who had just retired and are just beginning their RV adventures and volunteering. They mentioned that there are a number of huge boats and barges that come through Foscue and the locks. 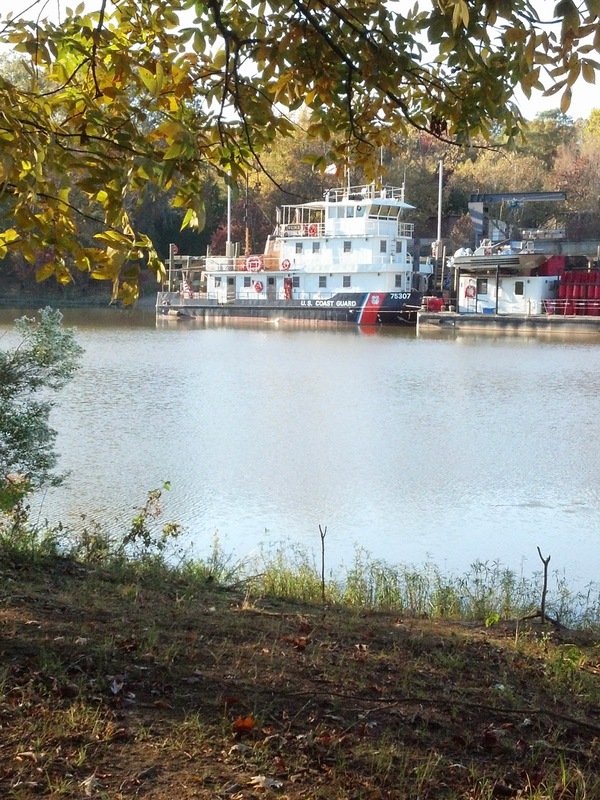 This Coast Guard tug is available for all kinds of work. If you enlarge the picture--just click on it--you can see a whole stack of channel markers on the barge. Jan and I have been pursuing Corps of Engineering campgrounds and also , at least, taking a look at state parks. Our next stop required a little travel away from the main routes. 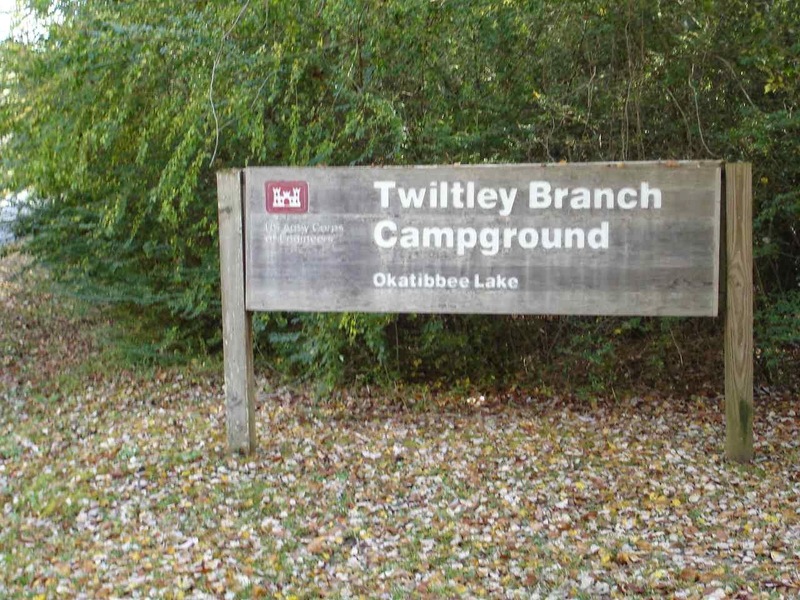 We crossed into Mississippi on Route 20 and then headed north to Okatibbee Lake and Twiltley Branch Campground. Again some very nice people working in these parks. A long ride into the sites from the entrance. But the sites are nicely placed on the lake. 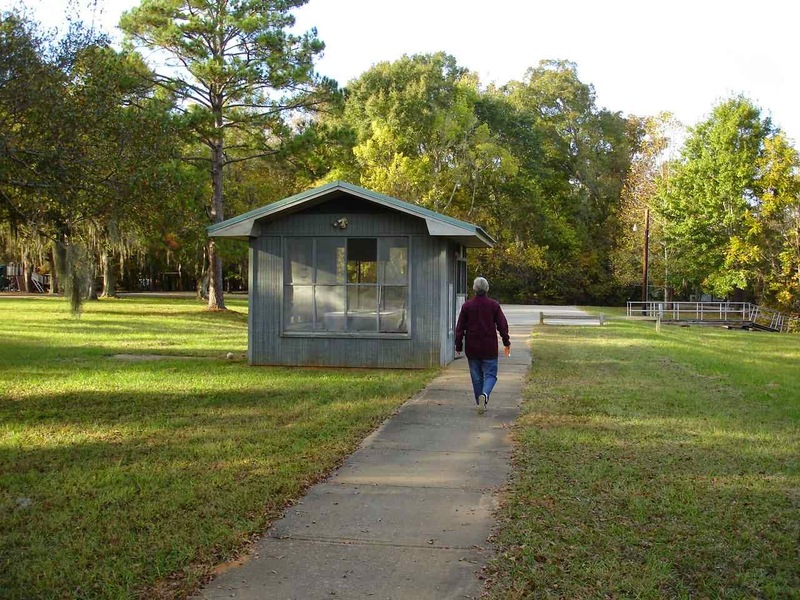 These corps parks serve as great resources in the communities. We always see fishermen and boaters. Also, a number of the parks like Foscue and Twiltley have Day Use areas that are well used by families for everything from walking to picnicking and playgrounds. Twenty miles back to Route 20, a popular trucking road, and a short ride to Roosevelt State Park. 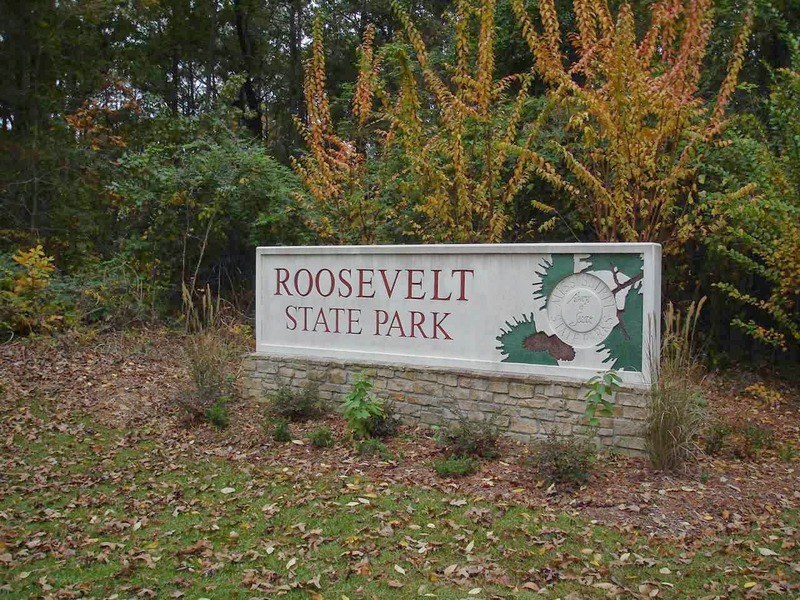 Roosevelt is slightly east of Jackson, the state capitol, and close to the highway. 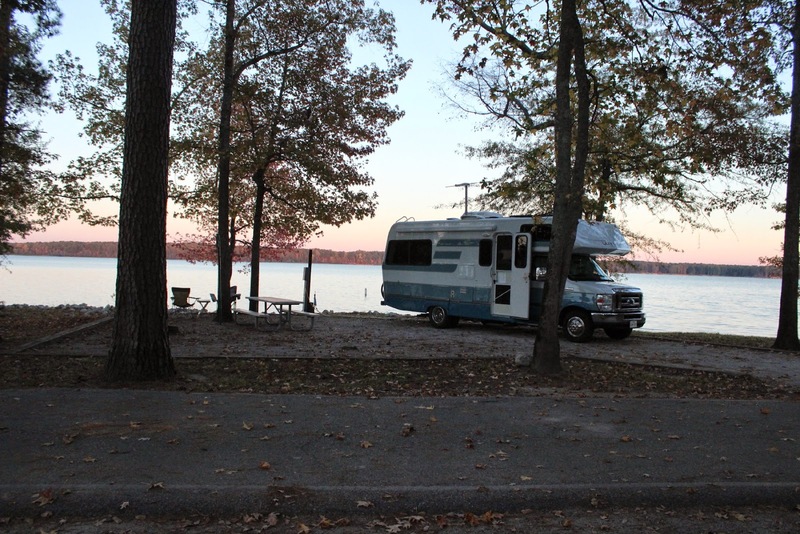 This is an older campground. There is a newer section that is closer to the highway. We are happy to have this nice view and a very level site. 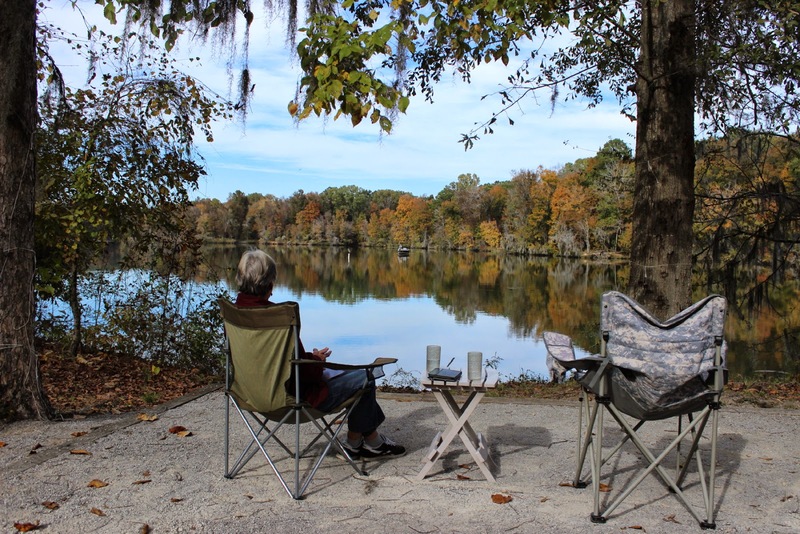 Mississippi state parks offer a senior discount. We were pleasantly surprised to find our final cost for the night was $14.91. Most other states have been charging close to $30 per night--or more--and will also add on a day use fee of up to $7 or more. This was also a full hookup site. This is recommended to all! A trip through Jackson is what you would expect on an interstate passing through a capitol city. Very, very, very busy. 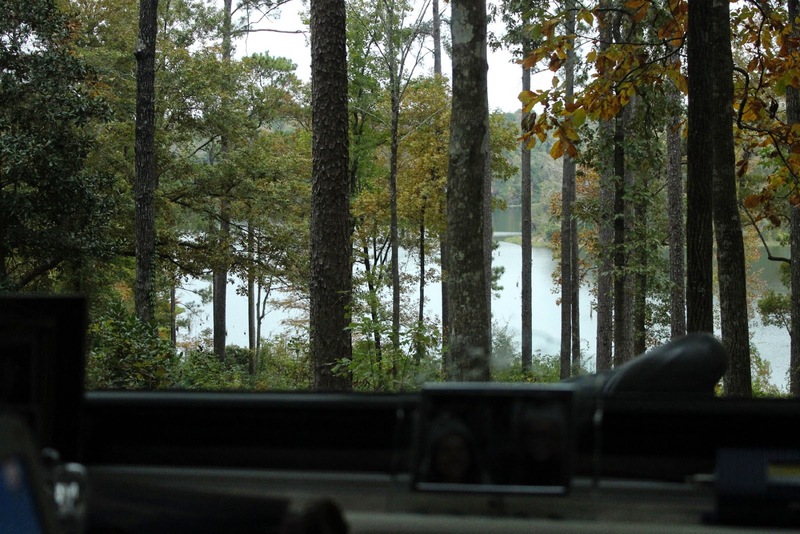 And then you turn on to the lower end of the Natchez Trace Parkway. And---no traffic!!! A country two lane road with few curves and a relaxed speed limit of 50 mph. Wow! 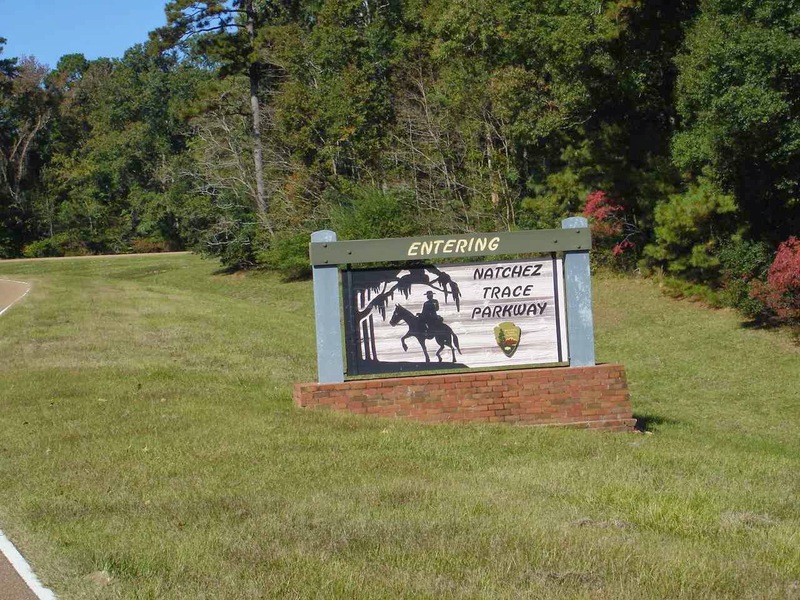 The Natchez Trace goes for 444 miles from Nashville, Tennessee to Natchez, Mississippi. It started as a buffalo trail, and was then well traveled by Indians. 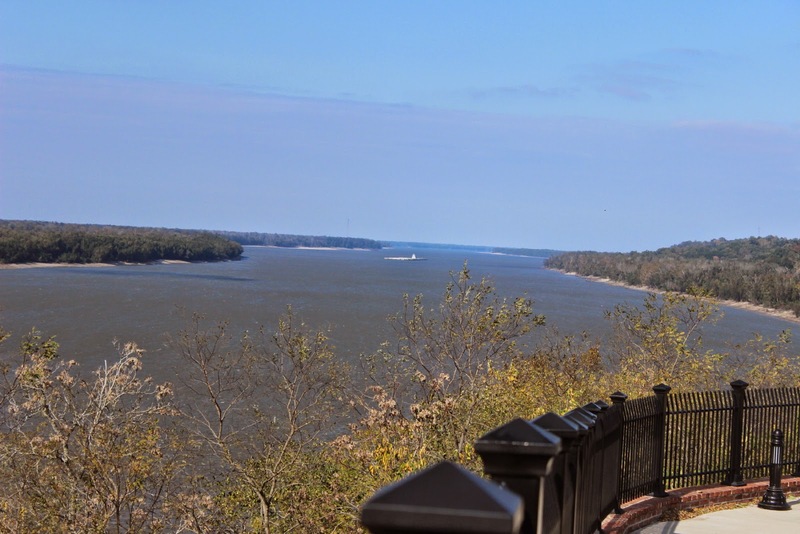 The settlers from Kentucky and the Ohio valley would boat their goods downriver on the Mississippi to Natchez. After selling their goods, they would also sell their boats for wood(it was too difficult to try bringing the boats upstream). Then they would hike the Trace back home. 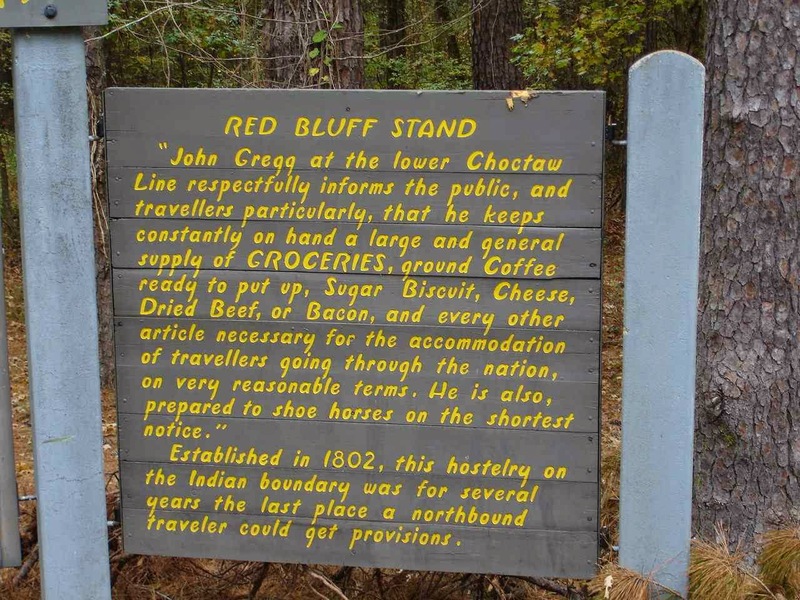 Click on the picture to the right to read about the last place for provisions on the trek north. There are some interesting stops on the way to Natchez. 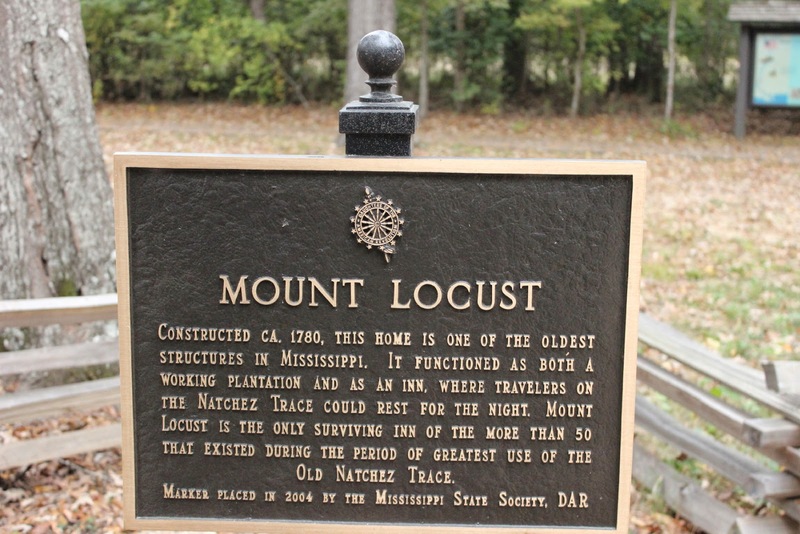 Mount Locust was an old style plantation--not large or fancy --as well as an inn for travelers. These are some pictures of the inside. 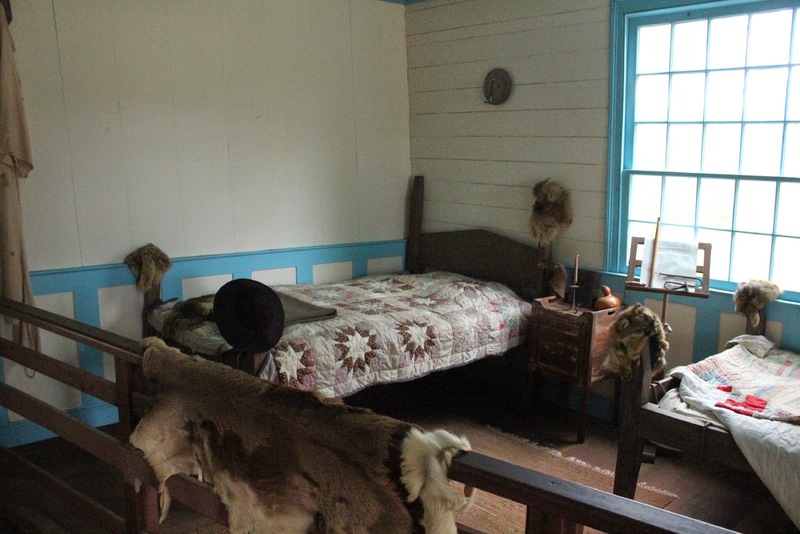 Very simple rope beds, but very comfortable rooms. These rooms were for the family. Inn guests first camped outside on the ground and then would stay in a small outbuilding for 25 cents per night--includes food. Very basic furniture and dishes. What more do you need? 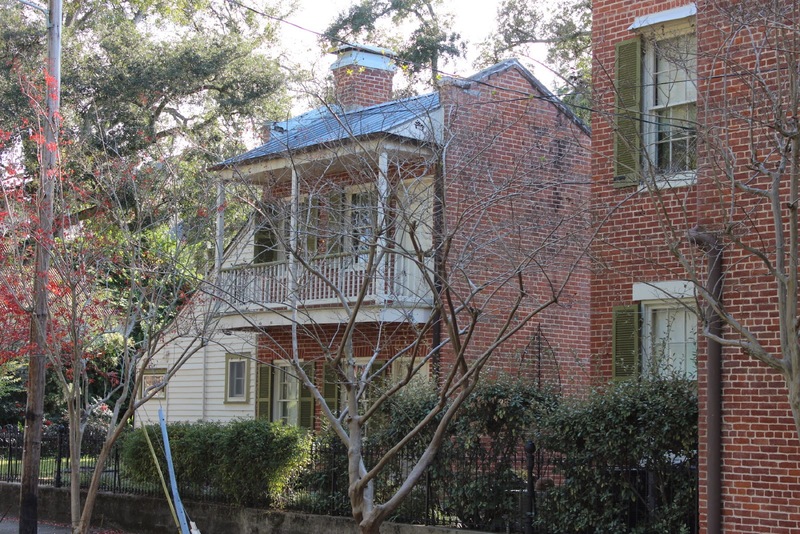 Compared to some other early 1800 homes that we have seen in South Carolina and on the Blue Ridge, this one is quite fancy. Note the well made brick fireplace and mantel. All kinds of tools in the back room. Also, outside, were a number of brick cisterns to save precious water in times of drought. We had been on part of the Trace a number of years ago in Tennessee. We will have to see about more of the middle section in the future. 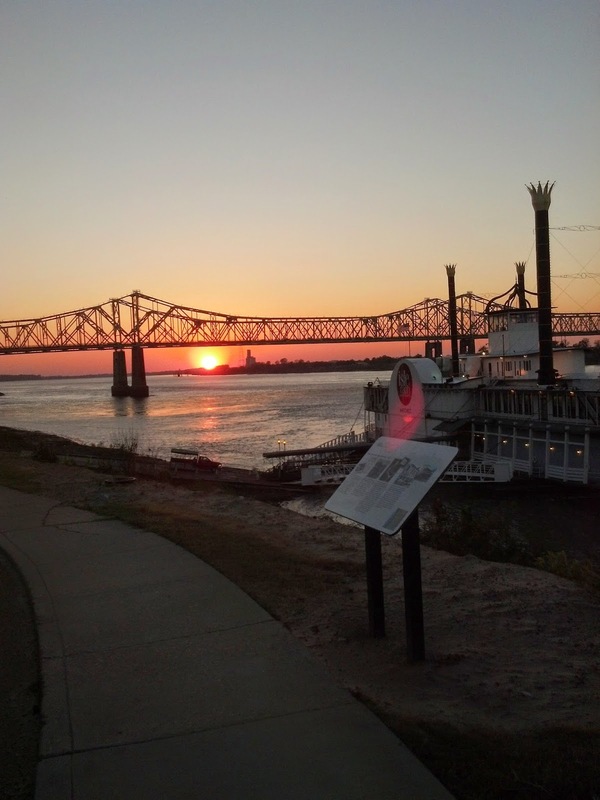 The Trace fell into disuse after the steamboats began their trade on the Mississippi. Jan and I needed to remind ourselves that in this early time there were no roads linked to Natchez. It was a river town. At the end of the Trace we opt for another Mississippi state park. 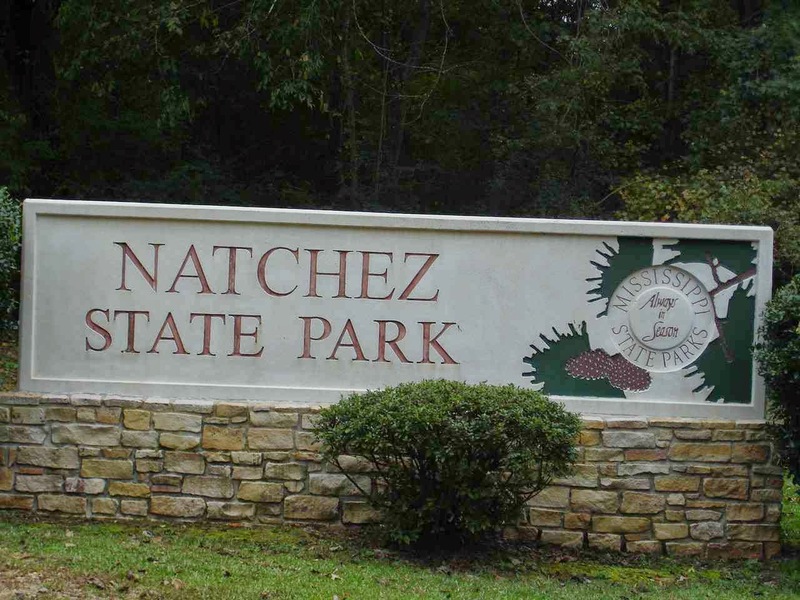 Very nice and close to the city of Natchez. 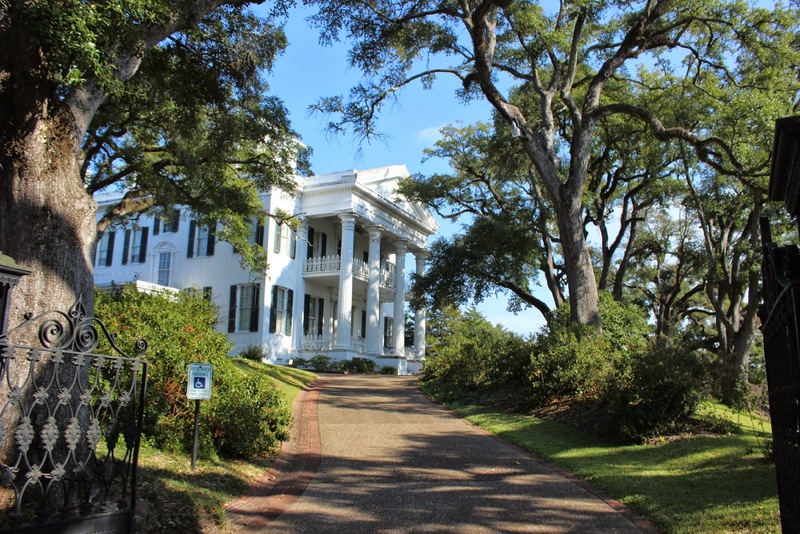 Natchez is now a tourist town. 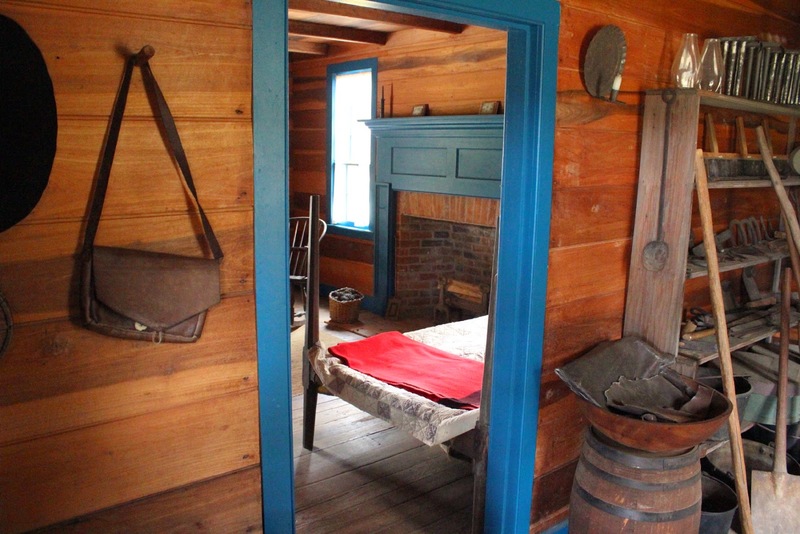 But in the antebellum age, it was a cotton town. And all of the cotton owners built their mansions in town to be close to the social and business activity. This one is the Rosalie, right on Canal street which is on the bluffs with a good view of the Mississippi. From just beyond the Rosalie on the bluffs, there is a great view of the Mississippi and the bridges connecting Mississippi to Louisiana. Jan and I had a great dinner right at the corner by the casino steamboat. Jan had wonderful grilled shrimp and I had a marvelous catfish plate topped with mushrooms and shrimp. The restaurant was the Magnolia Grill and we were the only ones there at the time. So-- a great view of the river. That last picture was from the river walk that goes for quite a ways along the bluff. This view is looking north. That boat in the middle of the river is a rather large barge. That gives you an idea of how wide the river is at this point. Jan and I were remembering our stop much further north in Minnesota. That was in Itasca State Park where we walked across the Mississippi at its beginning. This is Stanton Hall. 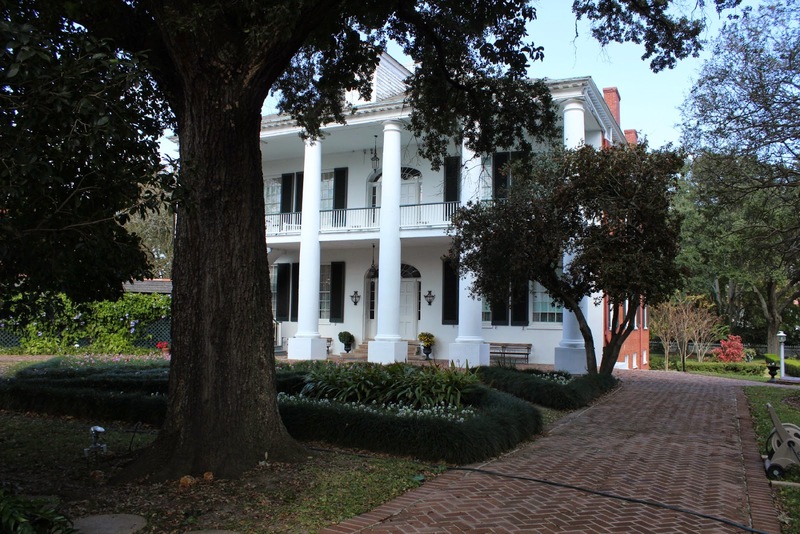 another beautiful antebellum home. Now it is home to a restaurant and museum with tours. 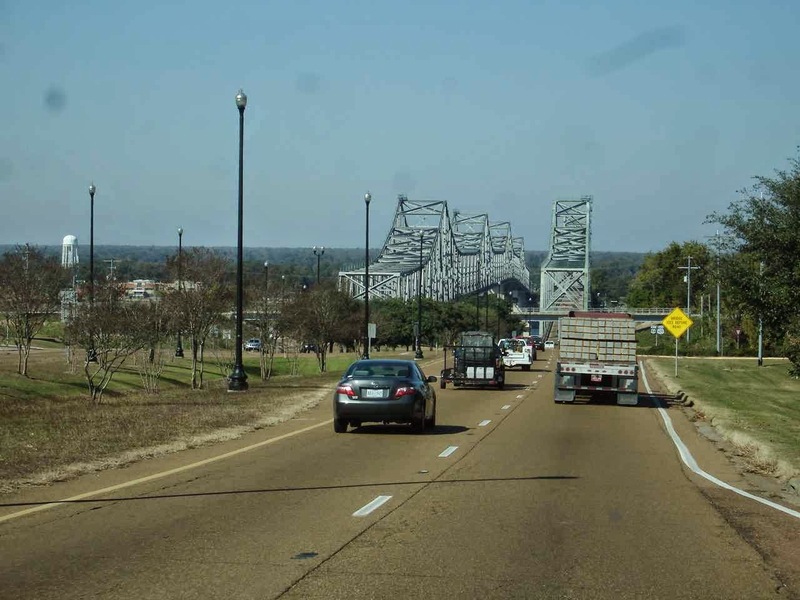 Natchez is a fairly small city with a spreading suburban community. As an historic city it represents many parts of American development. There is the early river trade before and after the Louisiana Purchase. There is the importance of cotton as the southern product. 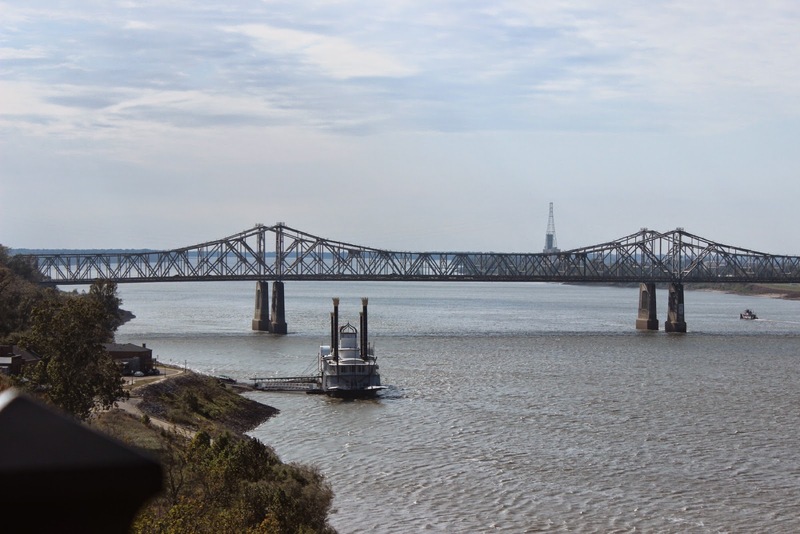 Natchez had more millionaires per capita before the Civil War than any other city in the United States.The destruction and changes from the Civil War. The destruction caused by the boll weevil to the cotton crop after the war--and the Depression age that followed. And then the resurgence of such towns when they reinvent themselves as tourist and business centers. Close to the Stanton Hall are these two brick houses. In the 1800's the one to the right was the main house for the owners. 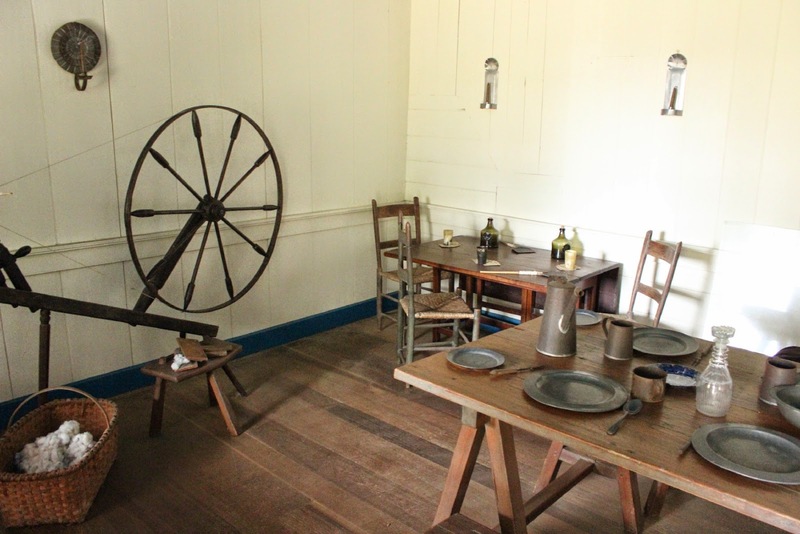 The small on to the left was the kitchen--to keep the fires away from the main building--and the servant quarters. This picture is from right in front of the Magnolia Grill after our dinner. We did not realize we would have such a view, so this picture is credited to our cell phone. What to do after Natchez? Cross the Mississippi, of course! This time, we are on Route 84, heading for Alexandria, Louisiana. 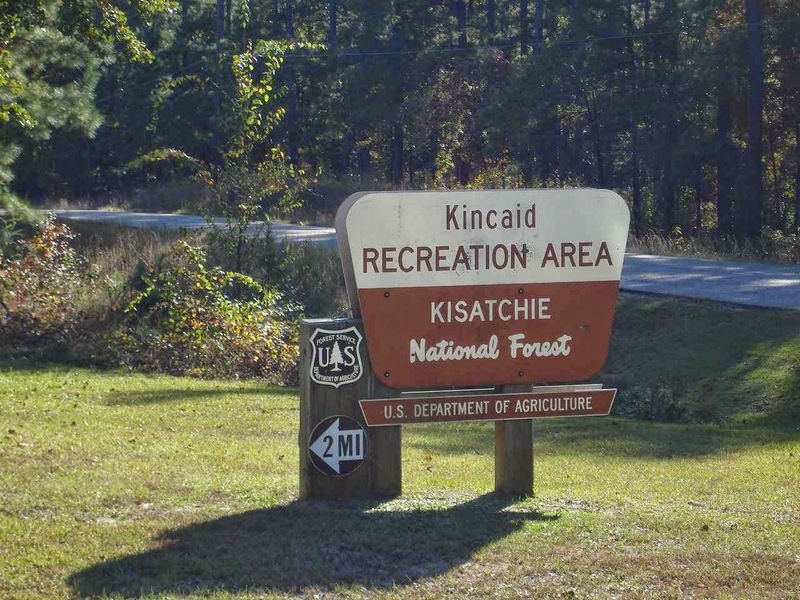 From Alexandria, we head south into the Kisatchie National Forest. We are staying at Kincaid Lake Campground. Not all National Forest campgrounds are created equal. This is a great one! The huge storm that invaded Alaska , sent its cold all the way down here to middle Louisiana. We indicated to Alison that two days ago we had about the same temperatures as Livermore Falls in Maine. Our high was 43 degrees and the low about 26!!! But--no snow and we are getting warmer!! !